My rainy Saturday started out a little rough. I was wandering around the wrong part of Korean University’s campus trying to locate a specific building with a google map, “near the GS25” and a few phone calls to my friend Francis. 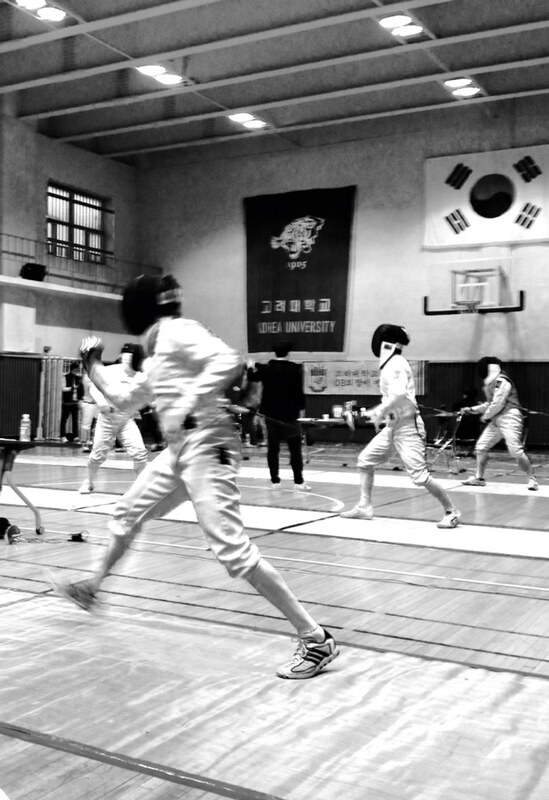 It wouldn’t have been so bad if it wasn’t pouring the whole time but eventually I made it to my first fencing tournament in Seoul with about an hour to spare before I had to compete. I’ve done plenty of tournaments so I wasn’t worried. I checked out the strips and watched some foil while getting myself “in the zone” when suddenly I saw my coworker Colin and his wife Ruth! I explained a little about the sport and told them I was glad to have a cheering squad. A few moments later I read what I thought translated to “Miekuh” under the pool. 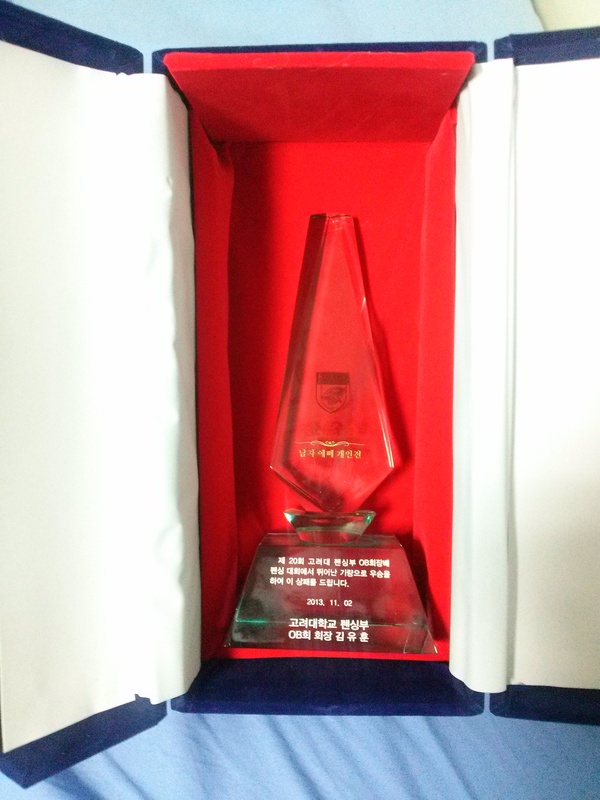 Everything was posted in Korean but I beamed with pride at something as trivial as recognizing my own name. 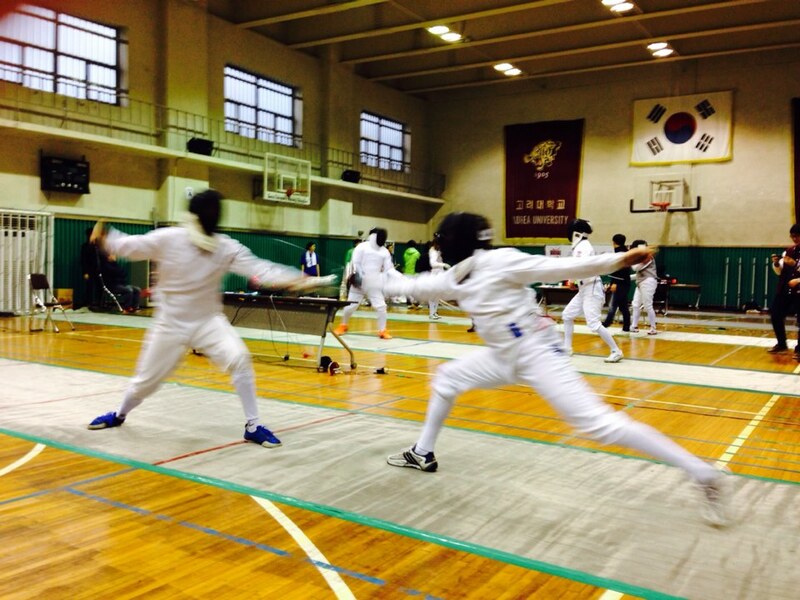 My club mates confirmed that I had my pool assignment; shortly after the real fencing began. The tournament went well; I went undefeated in the pool having only a few points scored on me through the first 4 bouts. I knew eventually my opponents would get tougher and started scouting my opposition. While waiting I made a few friends. 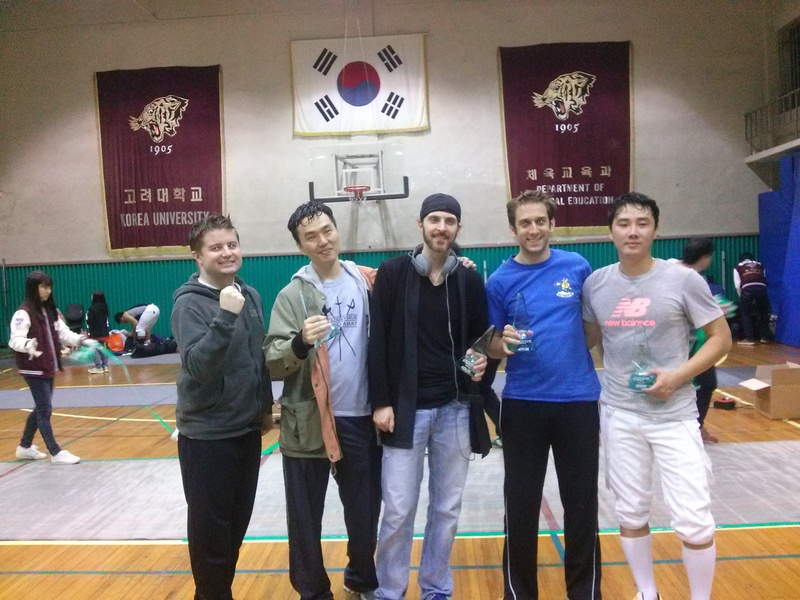 I’m happy to report that fencers in South Korea have the same positive attitude as back home. The guys I beat were hanging out with me cheering me. We discussed life in Korea and I learned that one of my opponents is dreading going back to his military assignment tomorrow but excited because he gets to work with a new tank. The 2 other white guys here were from my club and I fence a few times a week. Apparently they regularly make the finals and have a bit of a reputation for being the best ones here. I didn’t mind joining that circle and after easily beating my first two Direct Elimination matches 10-5 and 10-2 (they only go to 15 in the semi finals & finals) I was paired with my club mate Geoff in the top 4. He had just knocked out Francis in an unfortunate pairing that pitted them together in the final 8. Geoff was my first tough bout of the day. We went back and forth, touch for touch. Neither of us ever led by more than a few points. The first period ended 9-9 but I took a quick lead in the second and clinched with a 15-13 victory. On to the finals! I had been watching “orange shoes” all day. He had good distance, a quick parry-riposte and a strong blade even though he choked up on his French grip to get a few extra inches of reach. We started off touch for touch at 3-3 but then I made a few mistakes; trying to set up a feign disengage but my actions were too big. I kept pulling my arm back. I was down 5-3 before I adjusted my distance and snuck a few hand touches to bring it back to 5-5. Man this was a work out. My hand was tiring in this 4th DE 3 and a half hours after the tournament begun. I spotted those bright orange sneakers and he let me sneak into closer distance. I went in for the foot a few times, always coming up short but getting out in time to defend. I like how he was reacting and set up a feign to the foot before flesching. It was sloppy. I pulled my arm back and my actions were huge giving him the lead. Again and again I fell short, rushing in. Patience I kept telling myself with Geoff shouting advice and reminding me to take it easy and stop going to him. 8-5, I was down again. I had to stop charging in but the patience never came. I managed to bring it back to a 1 point deficit before the break but after that 1 minute he took off quickly ending the bout 15-9. All in all it was a great day. I took 2nd place, got a great workout and made some new friends. I’ve gotta remember to be a little more patient and am excited for the next tournament. I hope he’s there in his orange shoes for a rematch! 2016 – Was it really that bad? Hello,I checked your new stuff named “Stabbing a few Koreans before dinner | Live, Learn, Travel, Teach.” Your humoristic style is awesome, keep up the good work! Glad you enjoyed my humor! At least someone gets my jokes. Thanks for stopping by. Hi,I saw your article. Your story-telling style is awesome, keep it up! Thanks for stopping in. Glad you enjoyed it; I hope you keep reading! Hello, I desire to subscribe for this blog to get latest updates, thus where can i do it please help out.